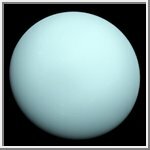 Uranus is the seventh planet from the Sun and is the third largest in the solar system. It was discovered by William Herschel in 1781. It has an equatorial diameter of 51,800 kilometers (32,190 miles) and orbits the Sun once every 84.01 Earth years. It has a mean distance from the Sun of 2.87 billion kilometers (1.78 billion miles). It rotates about its axis once every 17 hours 14 minutes. Uranus has at least 22 moons. The two largest moons, Titania and Oberon, were discovered by William Herschel in 1787. 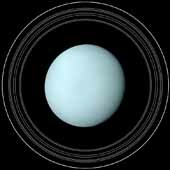 The atmosphere of Uranus is composed of 83% hydrogen, 15% helium, 2% methane and small amounts of acetylene and other hydrocarbons. Methane in the upper atmosphere absorbs red light, giving Uranus its blue-green color. The atmosphere is arranged into clouds running at constant latitudes, similar to the orientation of the more vivid latitudinal bands seen on Jupiter and Saturn. Winds at mid-latitudes on Uranus blow in the direction of the planet's rotation. These winds blow at velocities of 40 to 160 meters per second (90 to 360 miles per hour). Radio science experiments found winds of about 100 meters per second blowing in the opposite direction at the equator. Uranus is distinguished by the fact that it is tipped on its side. Its unusual position is thought to be the result of a collision with a planet-sized body early in the solar system's history. Voyager 2 found that one of the most striking influences of this sideways position is its effect on the tail of the magnetic field, which is itself tilted 60 degrees from the planet's axis of rotation. The magnetotail was shown to be twisted by the planet's rotation into a long corkscrew shape behind the planet. The magnetic field source is unknown; the electrically conductive, super-pressurized ocean of water and ammonia once thought to lie between the core and the atmosphere now appears to be nonexistent. The magnetic fields of Earth and other planets are believed to arise from electrical currents produced in their molten cores. In 1977, the first nine rings of Uranus were discovered. During the Voyager encounters, these rings were photographed and measured, as were two other new rings and ringlets. Uranus' rings are distinctly different from those at Jupiter and Saturn. The outermost epsilon ring is composed mostly of ice boulders several feet across. A very tenuous distribution of fine dust also seems to be spread throughout the ring system. There may be a large number of narrow rings, or possibly incomplete rings or ring arcs, as small as 50 meters (160 feet) in width. The individual ring particles were found to be of low reflectivity. At least one ring, the epsilon, was found to be gray in color. The moons Cordelia and Ophelia act as shepherd satellites for the epsilon ring. Historical background: Discovery of Uranus. Core & magnetic field of Uranus. Our knowledge of the internal structure of Uranus is inferred from the planet's radius, mass, period of rotation, the shape of its gravitational field and the behavior of hydrogen, helium, and water at high pressure. Its internal structure is similar to that of Neptune except for the fact that it is less active in terms of atmospheric dynamics and interior heat flow. This view of Uranus was acquired by NASA's Hubble Space Telescope and reveals a pair of bright clouds in the planet's southern hemisphere, and a high altitude haze that forms a "cap" above the planet's south pole. This is just one view of a sequence of three that can be obtained by selecting the above gif image. 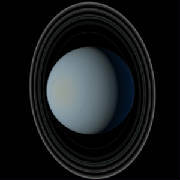 Hubble's new view was obtained on August 14, 1994, when Uranus was 2.8 billion kilometers (1.7 billion miles) from Earth. These atmospheric details were only previously seen by the Voyager 2 spacecraft, which flew by Uranus in 1986. Since then, detailed observations of Uranus's atmospheric features have not been possible because the planet is at the resolution limit of ground-based telescopes. Two additional Hubble Telescope images can be found here.